“There’s no crying in baseball”, or so goes the famous line from the movie A League of Their Own…Those words don’t apply when you’re done with baseball. It was obvious Lou Piniella had a lot of built up emotion that came pouring out in his final press conference. Lou has much on his mind right now with his mother in poor health. It must be extremely difficult after 46 years of doing something you love; knowing you will never do it again. Lou Piniella didn’t get the Cubs to a World Series but his back to back division Championships in 2007 and 2008 have certainly raised the level of expectations for the organization. I think that is part of what has made this season so difficult for fans; we now expect more from this team. This certainly isn’t how Piniella wanted to end his managerial career but a World Series victory at Wrigley and Lou riding off into the sunset had no chance in 2010. At this point it doesn’t matter how much you or I disagreed with Lou’s baseball choices and strategy. The bottom line is, he was a successful manager of the Cubs (at least during the regular season) and I thank him for his time and effort and wish him all the best. As Cubs fans we are in a familiar spot, looking towards the future and next season. I hope interim Manager Mike Quade and the guys tear it up from here on out so we at least have some fun in the final 6 weeks of this season. 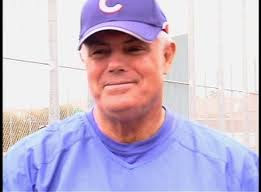 Managing the Cubs is a huge undertaking as Piniella found out, even saying at his final presser – “I don’t think when you come in as an outsider, that you know what you’re getting into”. With that in mind it’s widely speculated that the Cubs are looking for someone who has ties to the organization for the manager in 2011. The two big names fitting that criteria are Joe Girardi and Ryne Sandberg. Whoever the new manager is, it would be nice if he was successful and young enough to stay with the team a while. The last time a Cubs manager lasted more than 5 seasons was when Leo Durocher finished on the North side in 1972.